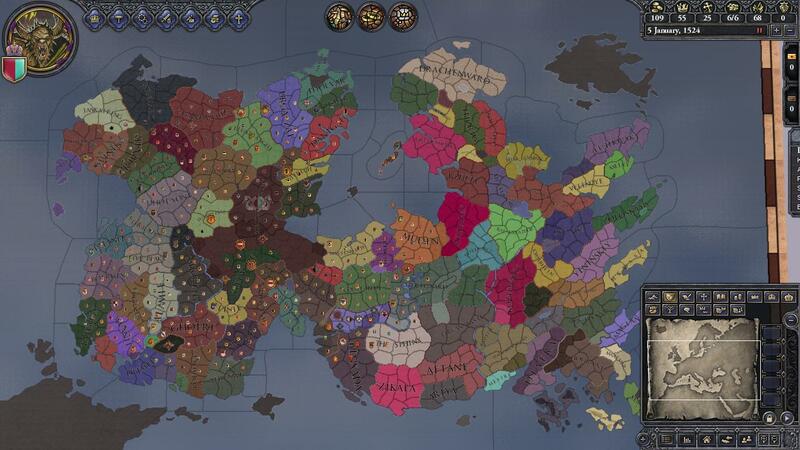 Hey guys, just to let you know that I've started on a Birthright mod for Crusader Kings II. I'm not *quite* at the stage yet where I'll need help, but keep an eye on it, because once I have the basic skeleton functional, I'll definitely need some Birthright experts onboard to fully build this mod to its full potential. (I made 2 of the gorgon's "children" listed here on birthright.net, Darnae and "The Brute of Kal-Saitharak". I may make more in the future. We're making good progress, but any help is appreciated! For example on making characters - we will need several hundred. 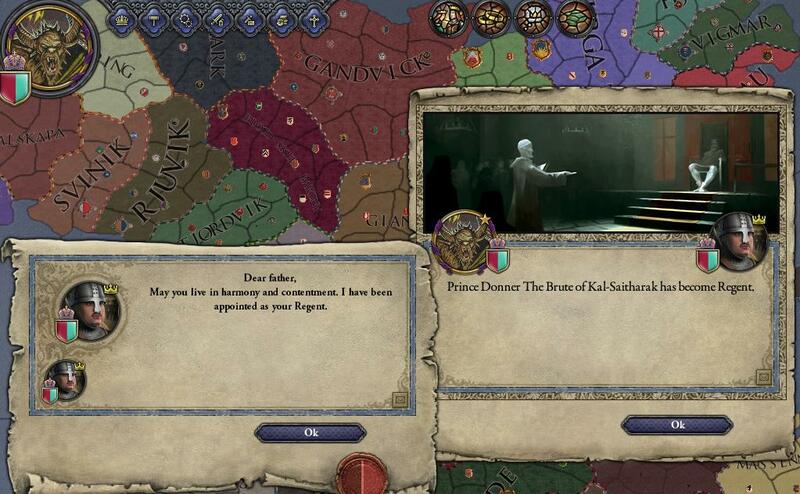 The rulers of the realms, their immediate families, and give them stats/traits. 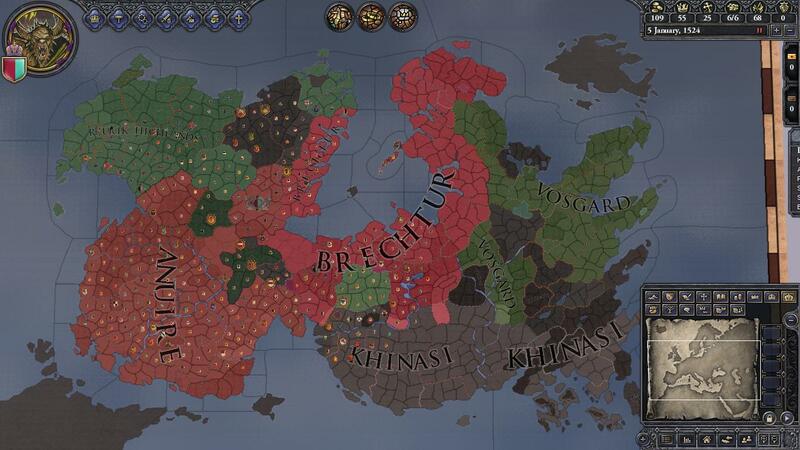 Also lesser vassals on the province level and notable henchmen/allies within the realms would be nice to include. 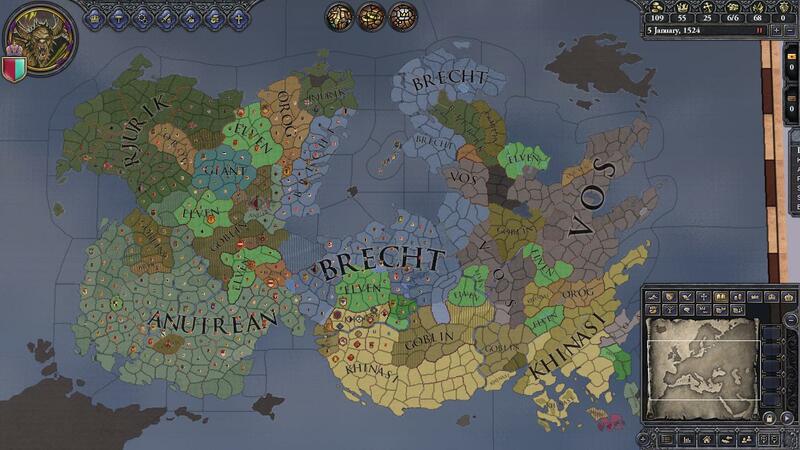 Crusader Kings II is extremely modder friendly, you don't need any advanced technical knowledge to do so. It is just simple .txt notepad editing for the most part, and I can explain how to make characters at least in 5 minutes or so. As for progress report, on the main thread I just posted an update on the magic system I am working on, will repost below what I wrote on the main paradox forums. Time for a preview of the magic system. While permission has been granted to adapt the 0.1.4 magic system from Elderkings once they release 0.1.5, there is another type of magic in the Birthright setting which will have to be built from scratch: Realm Magic. Due to many rulers having greater of lesser amounts of actual divine power flowing through their veins, they are capable of harnessing the power of the land that they rule to cast spells on a province-level, or even an entire region! They are also able to amplify the power of their combat spells, and summon free upkeep units. I m playing as the Gorgon, who is a master-level mage. 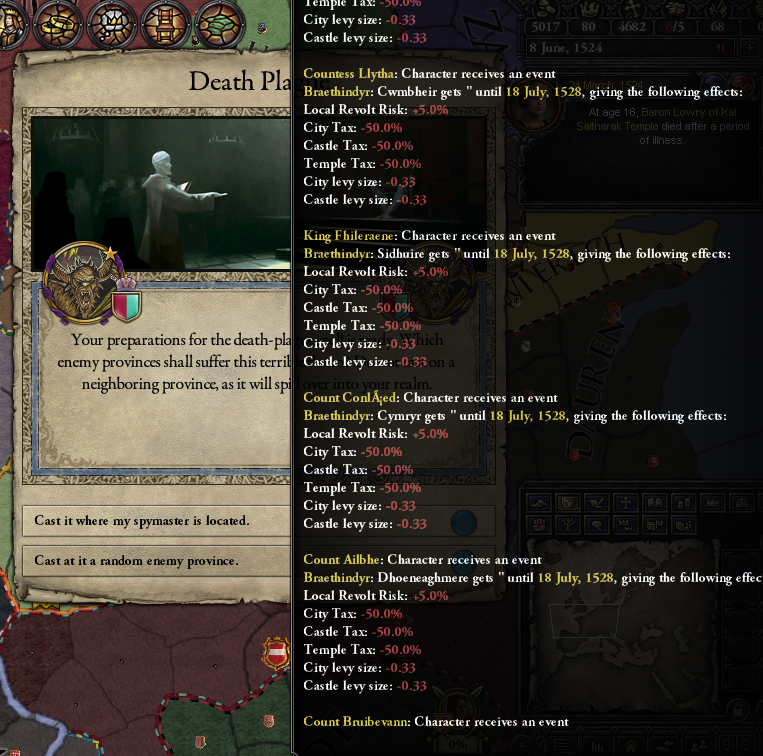 A religious CB will cost 500 piety/regency, but I'll just give myself 5000 regency and gold via the cheat console to get this demonstration going! Via decision there are so far 2 types of Arcane Realm Magic you can open. This is the "normal" one, which can be used for non-war purposes. With the Rajas of India DLC we'll be able to make special unit types, but so far zombies are light infantry, skeletons are heavy infantry, skeleton cavalry is light cavalry, and lesser daemons are horse archers. Each come in sizes of 100, and have varying costs in gold, ranging from 20 to zombies, to 75 for lesser daemons. 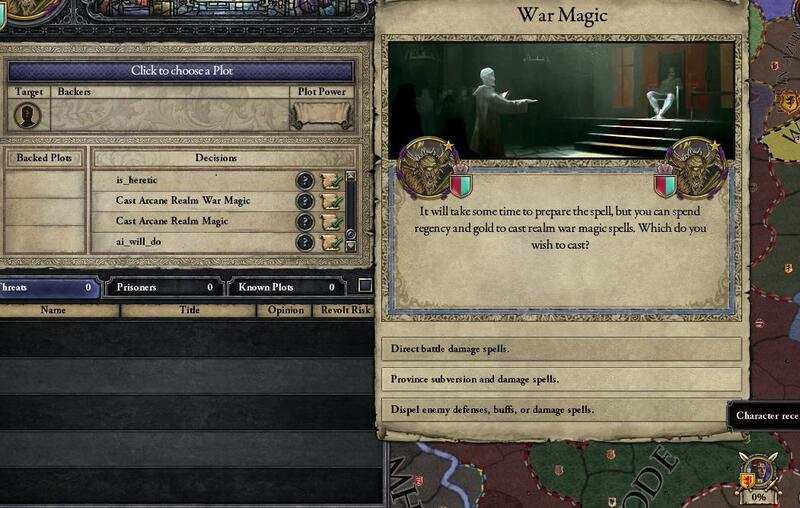 You'll also note that the Gorgon gains the trait "casting_realm_magic" - preparing spells of such power take a lot of time and concentration, in the case of summonings, it will take a full 30 days, in which a regent will have to be appointed to handle the day to day affairs of state, in this case, my brutish son takes over, which is a slight problem since he is an imbecile and has 0 stats in everything, except martial which is 25! You can prepare direct-damage spells, but so far only lightning storms are implemented however. Depending on your skill, you will then get either a novice, trained, master, or legendary version of the spell. Novice levels give 10% damage to all opposing units, while a legendary lightning storm gives 40%! Once the spell is prepared, it comes in via trait-form, and stays with you until you unleash it. So be careful of attacking a realm with many spellcasters... though their armies may be few, if those mages or sorcerers are commanders they may unleash their magical powers to even the odds. 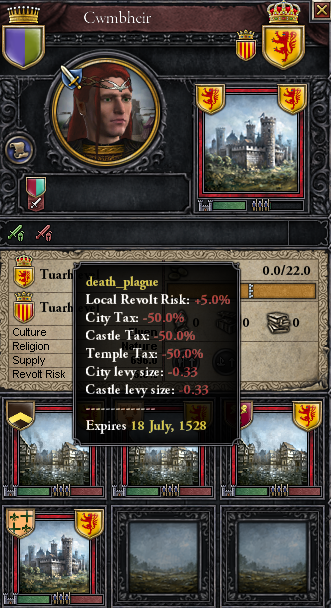 Province subversion spells are even more powerful, however. 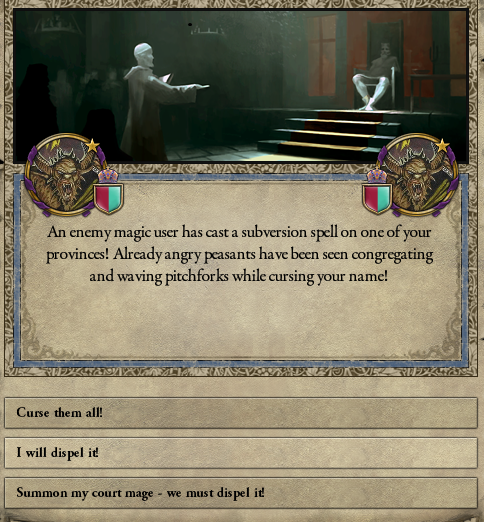 A novice or a trained magic-user will be able to cast either a plague or a subversion spell on their enemies. 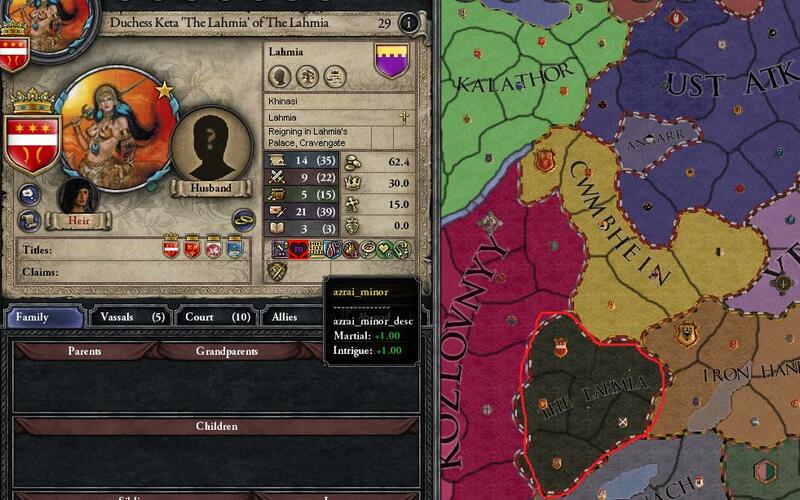 AI's will target a random province, but for a player you can select one by sending your spymaster to build a spy-network in an enemy province and target the effects on his location. 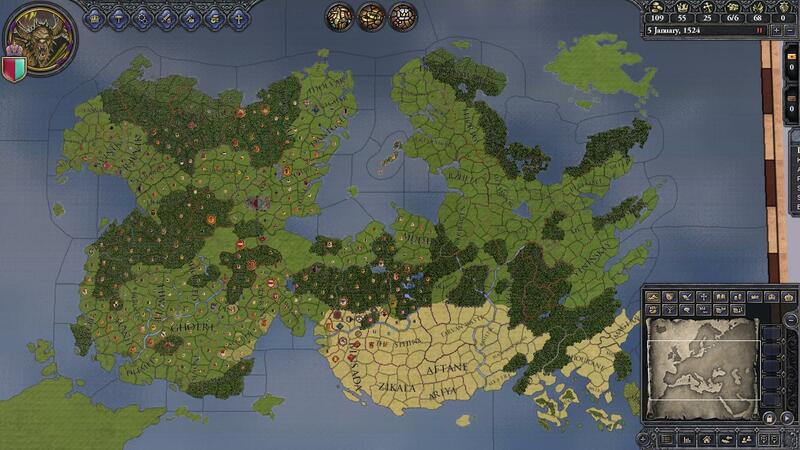 If you are a master or legendary level spellcaster, you can target an entire region - a single province, plus all the surrounding ones. As I am the Gorgon, I will start my assault on the elves by casting a giant plague on them! And well, that more or less shows how it will work in-game. There is a meta-strategy layer now, as you prepare to ward your provinces against these spells, dispel enemy effects, and have to wisely weigh the balance against using your regency/piety points to summon units or prepare damage spells, while still keeping enough in reserve to dispel enemy province-level spells which at this point can either cause 5-year plagues, or 2-year periods of increased revolt risk. Elves will probably also have some special defensive magic can be used in forested provinces, to give them a defensive edge against their more numerous enemies. But wait, aren't spellcasters vastly overpowered then? Yes, they are, but this is how D&D works. 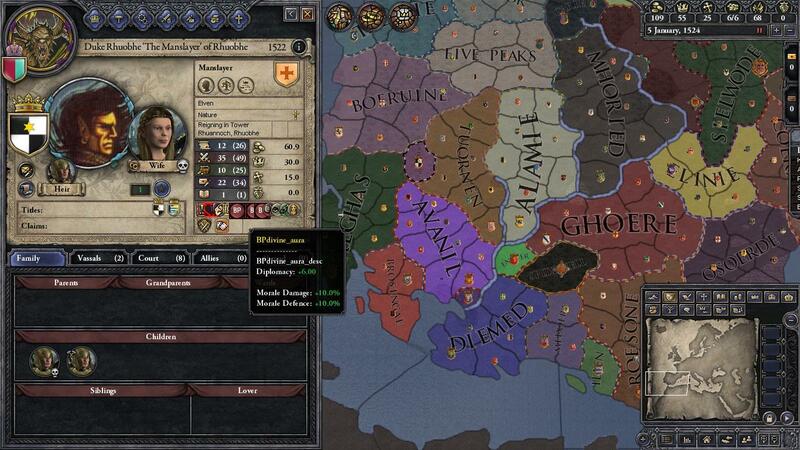 High level mages *are* overpowered, especially if they are rulers of a realm with vast resources at their command. 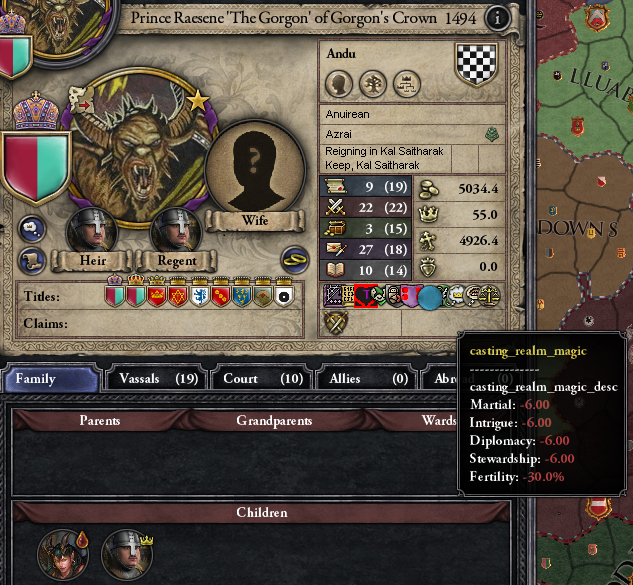 Thankfully, due to JasperClays better Congenital Traits mod, we have a way of making them very rare. In the Birthright mod, you can choose to take for yourself, or educate your children, in an "adventurer class": Fighter, priest, mage, rogue, bard, ranger, or (sorcerer, but more on this in a bit). 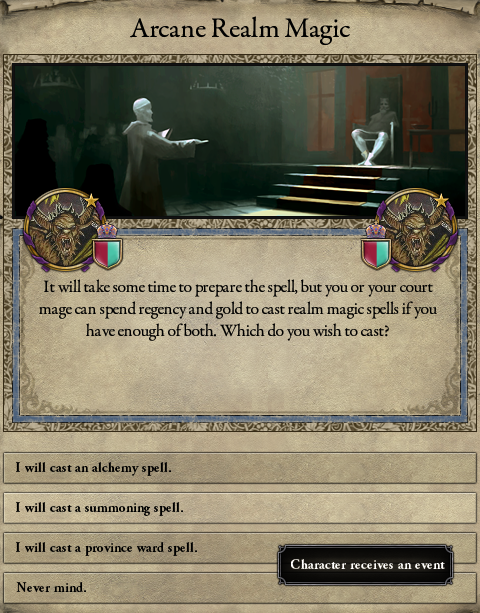 Anyone can become an amateur mage, but to become a novice mage, at the very least you need the trait intelligence trait "bright". 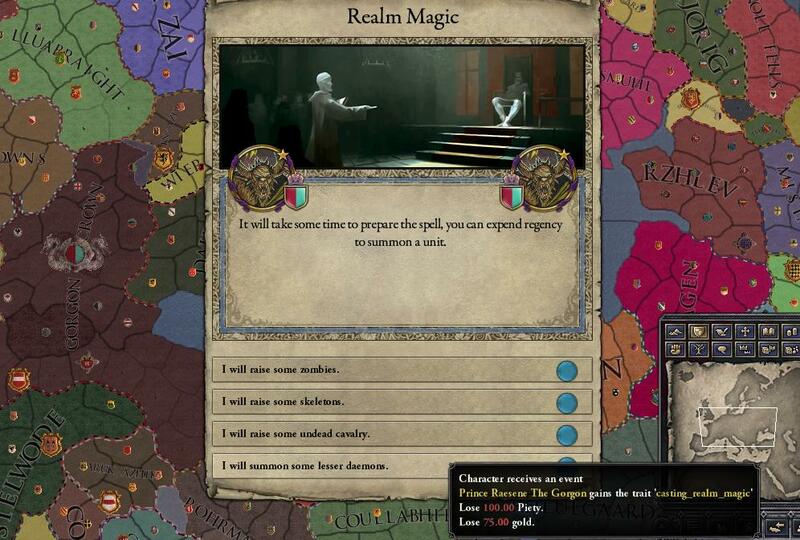 Trained mages need to be "smart", master mages need to be "quick/brilliant", and legendary mages need to have the genius trait. You can train for as many years as you want and go on as many quests as you like, but if you are not smart enough, you will not advance to the next level of the mage class. Sorcerers work a little differently; their magic is based on inherent power, not intelligence. However, you will need to be descended from a sorcerer to be able to BE a sorcerer, and not all descendants have the magic power in their blood. Thus, while extremely powerful, mages will also be quite rare. Also, at lower levels, in duels, mages will be outmatched by the fighter classes so will tend to die frequently if leading armies and fighting one on one battles. It is only at the master/legendary level that mages and sorcerers truly come into their own vs the other classes. I'll also make some kind of "craft magical item" decision available for high level spellcasters and priests. Want an amulet of immortality for your aging arch-mage ruler? 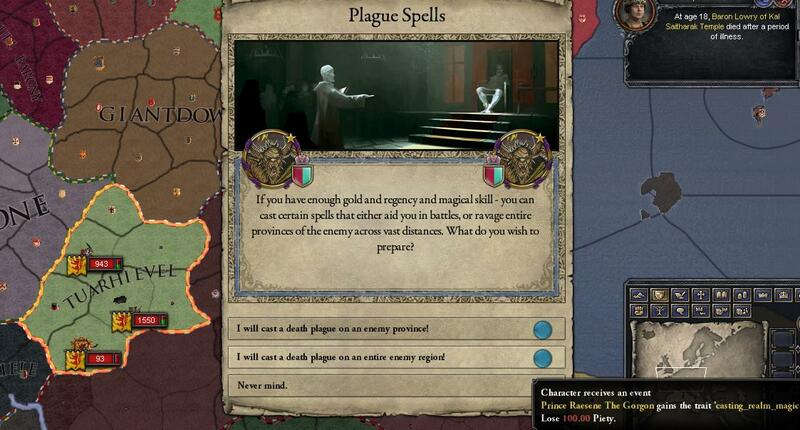 If you have enough gold and regency/piety, that might just be possible... or else there is always the path of Lichdom, though your subjects will of course disapprove! This is the list of sub-ducal realms I was using for Empire's Twilight, which might be of use to you. 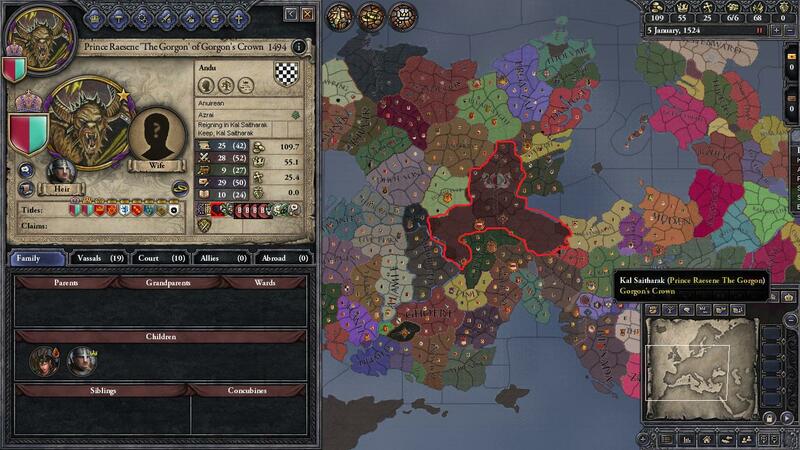 The Imperial City is an independent city-state, held in the name of the Emperor. Ius Hibernicum, in nomine juris. Quidquid latine dictum sit, altum sonatur.